Residents and activists say these projects will cause water shortage, resource crunch and escalate the man-animal conflict. 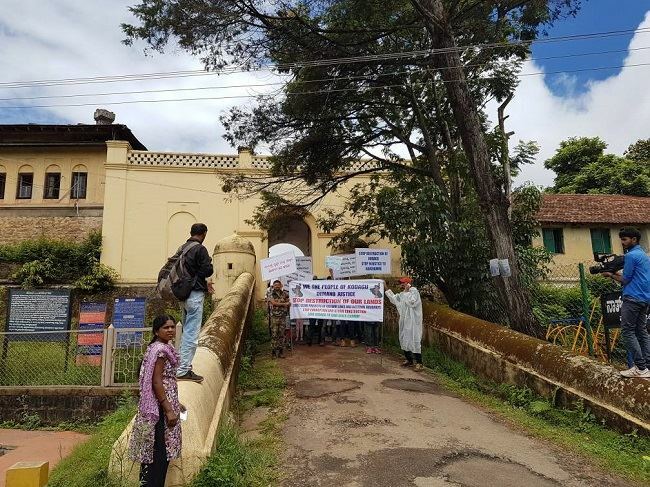 Close to 500 people gathered at the Madikeri fort in Kodagu on Friday morning. 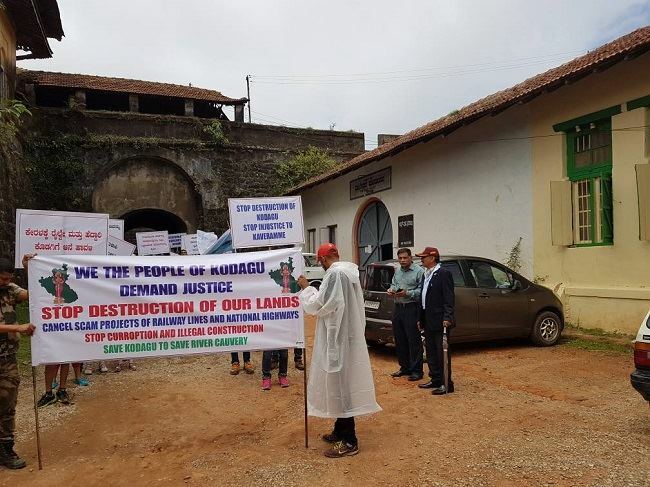 Their agenda – march to the town hall in protest against a number of infrastructure projects coming up in their district, and the adverse impact they would have on the natural landscape of Kodagu and the Cauvery river. 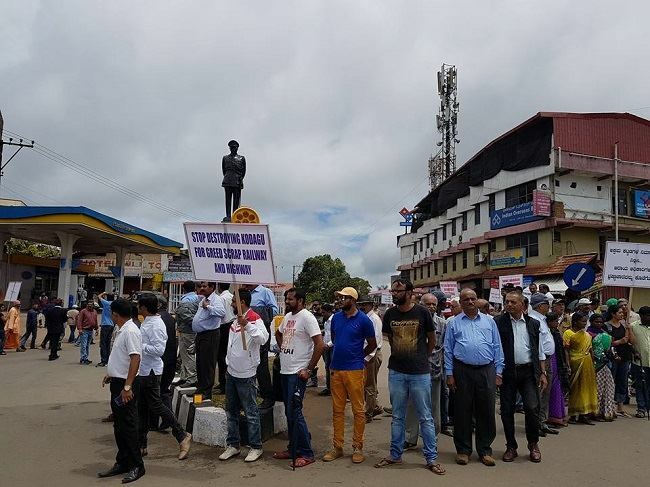 Representatives of a number of groups including Coorg Wildlife Society, Cauvery Nadhi Swatchata Andolana, Save River Cauvery Forum, Kodava Samaja Ammathi, Coorg Wellness Foundation, Clean Coorg Initiative, participated in the protest march, carrying banners, placards and raising slogans on their way. Machaiah Kalengada, one of the organisers of the protest march, hails from Kodagu. He points out three upcoming projects which he deems are unnecessary for the district. "There is a plan to push a railway line from Telicherry through South Kodagu, and another railway line from Mysuru to Makandur near Madikeri. An 80ft National Highway is also to be developed from Somwarpet to Madikeri, Murnad, Virajpet, Ponnampet and Kutta to Manantwadi in Kerala," he says. He explains that there are three major problems which these projects will cause in the district: water shortage, resource crunch and escalation of human-animal conflict. 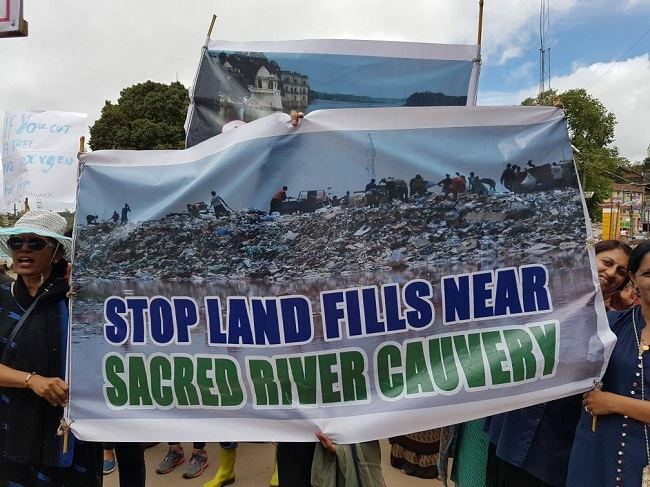 Devika Devaiah, a core member of the Save River Cauvery group, points out that because Coorg is the principal catchment area of Cauvery, the aforementioned infrastructure projects run the risk of hampering its path and flow in several ways. "Think of it this way - you have a tap running in your bathroom, and some place around it. So you place a chair, a stool and other things there. The water will still flow but there will be a lot of obstructions hampering it. The same will happen if all these railway lines and highways come up here," she explains. Machaiah says that in the past few years, quite some area of land in the district which was earlier used for paddy cultivation is now being converted into commercial land. "Earlier, the paddy would hold the water in the ground. But since the cultivation stopped, large patches of this land are being given for commercial purposes, especially tourism. Kodagu is a district of a little over 4,000 square kilometres and the population is 5-6 lakhs. But the number of tourists who visited in 2016 is about 12 lakh. How is that feasible?” he asks. As a result, large amounts of garbage and sewage are generated, with the district not being equipped to dispose it off. To substantiate, Devika recounts how the road next to Brahmagiri Wildlife Sanctuary has become a dumping ground of sorts. A state highway cuts through the sanctuary and is apparently used heavily by vehicles coming from Kerala. Some speculate that the dumping may be done by goods vehicles coming from Kerala. According to an RTI filed by Col (retd) Muthanna, a member of Coorg Wildlife Society, 2,800 acres of land has been converted and sanctioned for commercial use in the past decade. However, this does not cover the illegal conversions, Col Muthanna says. He explains the two scenarios of how illegal conversions happen. “One is where concerned authorities give permission to private and commercial entities where they shouldn’t or without following proper guidelines. For instance, a gram panchayat is supposed to give a notification to the villagers before giving land for commercial purposes. But they choose not to, and give a provisional no objection certificate to the private entity,” he says. The second scenario is where private players encroach on a land without proper clearances and start construction on it. Activities like these encroach on the wildlife’s territory, making them prone to enter areas which have human habitation, he explains. “In 2015-16 for example, the number of elephant attacks grew exponentially as they were completing work on the Mysuru-Kozhikode power line. The sounds of the machinery, as well as the buzzing of the power line itself – we suspect that it created a disturbance for the elephants, making them agitated and aggressive,” he says. With the railway lines that are proposed, Col Muthanna warns of another problem. “One of the railway lines will come through Somwarpet taluk. The railway track doesn’t touch the ground, but is laid on a slightly elevated area. The bigger elephants can cross this, but the calves cannot, and the herd won’t leave the latter behind. This is going to restrict their movement, pushing them in conflict with human settlements,” he explains. He also says that precautions like fences do not help. “Elephants are merely the messengers. Their aggressive behaviour is telling us that we are messing with the ecosystem in a way we shouldn’t,” he argues. Many would argue, however, that these highways and railways lines are a part of modernization and development. Devika disagrees. “We are not a remote district. There are plenty of roads connecting us to Tamil Nadu, Kerala and the rest of Karnataka. They can always increase the number of KSRTC buses, we have no problem with that. But at some point, we have to draw a line. There’s too much at stake here,” she says.